While the name of Craobh Cumann Naomh Brid did not make its first affiliated appearance until 1944 we know of course that our games were being played officially for many long years before then under the names of Kiltoom, Curraghboy or Brideswell depending on where the most enthusiastic bunch of players came from at the given period. The earliest record of football activity was from a Kiltoom team in January of 1889 when they defeated a team from St Johns on a score line of and I hereby quote the Westmeath Independent of the period “Kiltoom 3 goals and several points to St Johns no score”. Perhaps the electronic scoreboard broke down on the day! They certainly held the upper hand over St Johns in that era as a return game on March 23rd of the same year saw Kiltoom on this occasion emerge the winners by one goal and six points while the opposition was again held scoreless. 1919 saw a team from Curraghboy contest and win the South Championship of that year and while playing activity continued unabated throughout the twenties, thirties and forties there was no major success of note but obviously our players were not going unnoticed as we know that John Magee ,Paddy Kenny of Lysterfield and Larry Cummins were selected to play on the Roscommon minor team of 1938. The following year of 39 of course saw Larry and Paddy Donnelly become the very first players from the parish and Club to capture coveted All Ireland Medals when lining out with the victorious Roscommon Minor team of that year. While the game of hurling has never succeeded in becoming a force in the club the most serious attempt was made away back in 1920 when introduced to Brideswell national school by the then newly appointed Principal, a Corkman called Patrick O Sullivan. This small beginning would eventually see the affiliation of a hurling club called Brideswell in 1941 under the guidance of one George Harrison and given the origin of the aforementioned Corkman it is not surprising that the team colours were red and white. Sadly however this club would only last for about two years but the jerseys at least would remain in service becoming the official St Brigids colours of the footballers which George had now turned his attention to becoming their Chairman in 1944 thus the arrival for the first time of the present club name. In somewhat similar fashion to the hurling endeavours, Camogie has had a chequered history in the Club despite huge efforts by various people at various times. The Roscommon Champion tells us that a Kiltoom team played and defeated Strokestown in 1913 which represents a great achievement at the time given that the national camogie board was only formed in 1904 and in fact only formed in Roscommon County in 1912.The next period that we know of is the founding of a Brideswell Club in 1941 in conjunction with the hurling Club but sadly it too seemed to expire with the disbanding of same. A rather unusual decision at a Club AGM in 1948 saw a Camogie sub committee set up to promote the game but strangely enough it consisted entirely of yes you have guessed correctly MEN. It should be pointed out that encouragement from higher bodies was not always forthcoming as there was various periods from the thirties right up to 1966 when County committees did not even exist. Brigids efforts continued however through the sixties with the first ever title at County level being won in 1971 in the form of a 10 a side Winter league. Another serious revival in 1982 saw the most fruitful run enjoyed by camogie with county junior championship wins in 1984 and 86 followed by the league and championship double in 87 but sadly the end of that decade would see yet another decline in the game with no revival since. The mid seventies however would see the arrival of Ladies Gaelic football to our Club and where despite the predictions of the sceptics at the time it has in the ensuing years gone from strength to strength and now enjoys its rightful place in our sporting calendar. 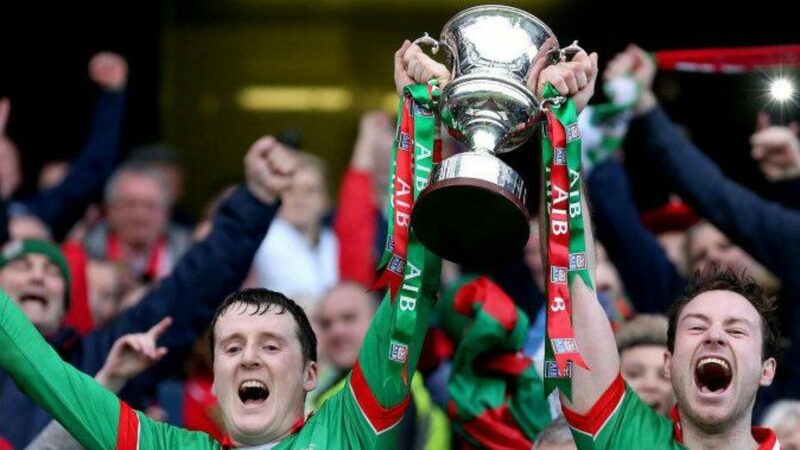 It was however since 1998 that the real progress has been made which has seen County titles being captured at U12,14,16,Minor 9 and 15 a side, Junior and Intermediate. The year of 2004 will of course always belong to that highly committed and dedicated bunch of Girls who carved St Brigids greatest ever chapter in history with the winning of what will always remain an unforgettable All Ireland Title. Undaunted by the move into Senior ranks they have captured the county title in this grade without a break up to and including 2008. While the Senior mens side made their own piece of history in 2007 by capturing their third county title in a row not forgetting of course that great Connaught Title in 2006, they were well and truly upstaged by their U21 counterparts who captured an amazing seventh consecutive county title in 2008. The Clubs headquarters of course stands at Newpark in Kiltoom where development has continued through the years since the original purchase of five and a quarter acres for the large sum of one hundred and fifteen pounds in 1953.Thanks in no small way to the continued support of the community and the Clubs many generous sponsors St Brigids can now boast of 3 Floodlit pitches as well of course as its Handball complex at Curraghboy and can feel justly proud of its achievements as the GAA arrives into the 125th year of its existence.